Three complete exercises on the past simple/past participle forms of the most common verbs in English. It includes a worsearch, exercises, fill - in the blanks, and a complete chart. Hope you like it! 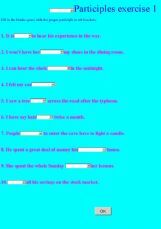 Listen to the song and fill in the blanks. It큦 useful material to practice listening skill and also past participle forms. Enjoy it! 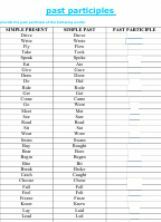 while regular past participle verbs are merely understanding ( +d, or +ed) the irregular past participles are more on memorization since there is no rule to follow. 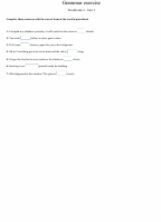 THIS EXERCISE IS A WAY TO EVALUATE THE KWOWLEDGE OF VERBS IN PAST TENSE PARTICIPLE.